Pope Francis: Is There a Submerged Schism in the Catholic Church? Pope Francis announced the third consistory of his pontificate the day after Cardinal Angelo Bagnasco was elected President of the Council of European Bishops’ Conferences (CEBC). The two events are not linked. But the two choices indicate two different orientations. And this leads to a question: is there a submerged schism in Pope Francis’s Church? The formula “submerged schism” was first coined by Pietro Prini, a Catholic philosopher who wrote a small book lamenting that Catholics were becoming ever more detached from the teachings of the faith. Yet, in a paper, “The New Pagans and the Church,” that he penned back in the 50s, Joseph Ratzinger had already noted that there were Catholics who proclaim themselves as such but who live as pagans. Ratzinger got it first, but he did not use the formula “submerged schism”. Even Cardinals Gehrard Ludwig Mueller and Walter Kasper talked about a “hidden schism” or a “pragmatic schism” for what concern the Church’s teachings at the eve of the Synod 2015: it is a sign that the topic is indeed hard hitting. However, the submerged schism that Pope Francis is living is different. Talk about a “submerged schism” is strong – certainly stronger than the reality it describes – but it is helpful to recall one point: that while Pope Francis’s choices for bishops and cardinals tend toward one direction, bishops from all over the world are taking a different approach. In fact, Pope Francis’s choices and those of other bishops are two sides of the same coin, and the one completes the other. Let’s look at the data. Pope Francis’s third consistory is once more a consistory of peripheries. There is just one cardinal from the Curia (Kevin J. Farrell), and he was recently appointed; for three countries, the red hat is a first time event (Lesotho, Bangladesh, Central African Republic); the European portion of the College was reduced to 52 red hat. 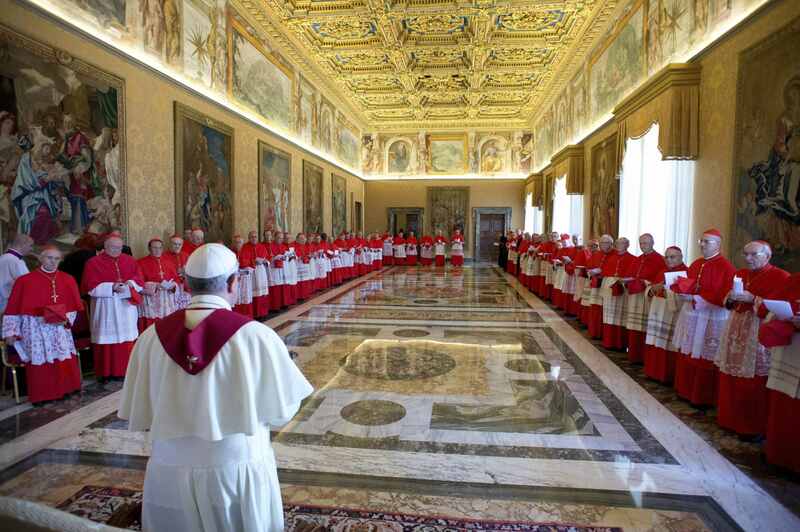 There are 3 cardinals from Europe, 3 from North America, 3 from South America, 2 from Africa, 1 from Asia and 1 from Oceania, a continent to which Pope Francis has awarded a red hat in each consistory he convoked. The new cardinals are all characterized by a pastoral approach not linked much to doctrine. In the United States, a red hat went to Archbishop Blase Cupich from Chicago, who many consider as the symbol of the paradigm shift that Pope Francis is undertaking in the US Catholic Church. The United States will not be a place for cultural warriors anymore, but instead a place for bishops dedicated to “dialogue”. Even the choice of Archbishop William Tobin of Indianapolis is surprising: he was Number Two in the Congregation for Institutes of Consecrated Life, but was sent to Indianapolis because of the way he tackled the issue of the LCWR sisters. After a Vatican investigation and a doctrinal assessment, the LCWR sisters were not subjected to any particular disciplinary measures - beyond the implementation of the doctrinal assessment presented by the Congregation for the Doctrine of the Faith back in 2012. The same line is represented in Europe by Archbishop Jozef de Kesel from Brussels. His predecessor, Archbishop André-Joseph Leonard, was not created a cardinal, though he made vocations to the priesthood re-flourish in his diocese and he re-opened churches that had been closed for a long time. His successor, on the other hand, exiled one of the fraternities that was full of vocations and that was invited into the archdiocese by Archbishop Leonard. De Kesel is characterized by a soft approach toward the Belgian government, even if some of the government’s recent choices lead one to think that a neutralization of religion is underway in public schools. These choices show that Pope Francis prefers bishops with a “dialogue” profile, rather than bishops ready to counter the secularization process. As the Pope himself always says, the faith can be spread through attraction, and this attraction implies a “soft” preaching, that creates no conflict in the cultural or even the political environment. According to Pope Francis, Christians should attract because of their lifestyle. And in saying this, the Pope is not in contradiction with his strongly worded statements against gender ideology or on behalf of the promotion of the family or even in the defense of freedom of conscience and freedom of education: these issues are not only present in his written statements, but also in his off-the-cuff remarks that in fact reveal more than anything else about Pope Francis’s thinking. The majority of bishops seem to have taken the opposite direction. This was proven first of all by the bishops whom the local bishops’ conferences chose to take part in the 2015 Synod: all of them were “conservative”, if we want to consider the classical categorization that in fact says nothing about nuances. “Conservative” is not a negative word, and those who defend doctrine do not do it on account of backwardness or any sort of bias. They do it with the profound conviction that Christian teaching is so good that it cannot be watered down by fashionable ideas. They think that this teaching must be proclaimed with no filters, in a gentle but determined way, without being defeatist. A Church that takes steps backwards is a Church that loses its strength to change the world. The Church’s agenda is in the end the common good. Is Pope Francis a victim of this bias – that is, the bias of a Church that substitutes true dialogue with the watering down of principle? It is difficult to see. He is more likely a victim of the way the Church is perceived, especially because of the attacks of the secular media that shaped a public opinion certainly not fit to understand fully who the shepherds of the Church are. There is a stronghold of the Church, and that is Europe. The Church is universal, but Europe is still a cradle of civilization. From Europe came the Marxist categories later used in liberation theology. From Europe came the first law that allowed homosexual marriage, in vitro fertilization, euthanasia and surrogacy that now all the world is discussing. Europe is the place from which the secularizing process started, with Martin Luther’s reformation first, and then with the Enlightenment that was nurtured in the Protestant notion of freedom of conscience. If there is a place where the challenge between the Church and the world is being played out, that place is Europe. And European bishops made their choice to fight the battle, and elected Cardinal Angelo Bagnasco as their President – going in some ways against Pope Francis’s trend. Some further details must be given: the Council of the European Bishops Conferences (CEBC) includes all the presidents from the European bishops’ conferences, according to geographical criteria (for example, the President of Russian Bishops’ Conference is a member of the CEBC, though Russia is not part of the European Union). The CEBC is different in terms of purpose and composition from COMECE. This latter is a committee that gathers the bishops delegated from each bishops’ conference in Europe and monitors the political process of the European Union. While COMECE deals with the European Parliament, the CEBC coordinates more with the Council of Europe’s work on human rights – Pope Francis underscored this CEBC task during his November 25, 2014 speech to the Council of Europe. Choosing Cardinal Bagnasco as their president, European bishops delivered a clear message. The President of the Italian Bishops Conference, more than anyone else, was the one who alerted the others to the construction of a world order without God with the aim of excluding religions from public life. European bishops also elected two deputy-presidents: Cardinal Vincent Nichols from Westminster (London), a champion on social issues and particularly on human trafficking, but also a bridge between Europe and Great Britain after Brexit; and Archbishop Stanislaw Gadecki of Poznan (Poland), whose words in defense of doctrine strongly resonated during the 2015 Synod – Polish Bishops were among those who defended orthodoxy. These three appointments give clear indications of the priorities of the European bishops: a glance toward the East, where lies the hope of Christianity and where the citizenry in Poland, Croatia, Slovenia, Slovakia and Hungary, for instance, is involved in movements to defend the family; a glance toward Great Britain which will leave the European Union, but remains a reference point for dialogue with the Anglican world; and a general goal to promote a Europe with more faith and less secularization, that is, a Europe ready to defend its original values. This choice must not be under evaluated. Cardinal Bagnasco’s term as the Italian Bishops’ Conference’s President expires next year, and Pope Francis will have to choose his successor out of a set of three names presented by the Italian bishops. It is likely that Cardinal Bagnasco will not keep his post at the helm of the Italian bishops, as it is said that the Pope does not like his style – and the Pope himself gave a clue of his dislike in not taking part in the National Eucharistic Congress in Genoa, the see of Cardinal Bagnasco. A change of the guard at the helm of Italian bishops might be expected, but Cardinal Bagnasco will not lose his post as CEBC President. According to the statutes, he will keep his post until the end of the term, even if he is no longer president of the Italian bishops. This detail is revealing: the European bishops elected a president that might become a full-time president, able to carry on working on the big issues that are often underestimated. This is where the small schism of Pope Francis’s Church takes place. The Pope wants a church that is “outward bound,” and wants bishops and cardinals that represent his view. 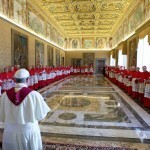 His real reform is that of the profile of bishops and of the College of Cardinals: after 3 years of his pontificate, 44 Cardinals created by Francis will be able to vote in a conclave; the College of Cardinals is less Eurocentric – there are 54 European Cardinals, in 2013 there were 59 – and his members are called to focus on pragmatic and hard-hitting issues. Not by chance, the list of the new cardinals opens with the name of the nuncio to Syria, Archbishop Mario Zenari, and with Archbishop Dieudonné Nzapalainga of Bangui, in order to show Pope Francis’s concern toward victims of war. This pastoral concern, this pragmatism on which the Pope pivots the preaching of the Gospel, as well as ecumenical and interreligious dialogue, is based on the notion that “realities are greater than ideas”, as he stated in “Evangelii Gaudium”. The bishops take on this concern, but they add to it the necessity of sincere and clear preaching in order not to water down the truth of the faith and to have the courage to attack the marginalization of religion. This marginalization is at the basis of that spiritual crisis which Pope Francis emphasized as one of the bases of the economic crisis, and that is also at the basis of the crisis of values. That this small schism between the local and universal Churches is taking place – but perhaps “split” is the right word – is paradoxical, since it is taking place when the Universal Shepherd wants to highlight local realities, and also to give them more responsibilities. However, a good example of how this “schism” is taking place is provided by Bishop Giuseppe Pasotto of Tbilisi. He praised the papal visit to Georgia. He noted that ecumenism can be carried forward by working together with other Christian confessions. He recalled that the Pope insisted that theology will come later to ecumenism, but that an ecumenical path meanwhile has to be made “in walking together.” But Bishop Pasotto also noted that, at least at the local level, theological issues must be tackled. It is on theological issues that division among Christians persists. His words proved two things: that from peripheries the Church can be seen better, as Pope Francis said, and that the peripheries really want a center on which they can rely.